2TouchPOS is directly integrated with GeoVision software and capture cards. The program uses the network to send real time text overlay form the POS terminal to the DVR. We do not require middle ware which eliminates the need for additional hardware at each station you want overlay on. Other systems that use overlay capture boxes only capture the data sent to the printer, we capture every key stroke. What that means is that we are one of the few, if not only, companies that can capture all deletes and cancels along with all sales of products. Employees are far less likely to try an trick the system when they know we are tracking every key stroke they make. The GV-FE421 is a fisheye camera that allows you to monitor all angles of a location using just one camera. The distorted hemispherical image of the fisheye camera will be converted into the conventional rectilinear projection. Without installing any software, you can watch live view and utilize functions such as motion detection, privacy mask, and alert notification through the Web interface using an IE browser. In addition, the GV-FE421 seamlessly integrates with the GV-System, providing advanced monitoring and video management features. 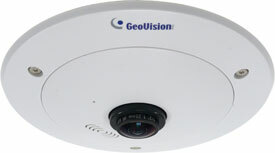 The GV-Fisheye IP Camera is designed to be mounted on the ceiling, wall or ground. There are two ways to mount the GV-FE421 on the ceiling, Hard Ceiling Mount and In-Ceiling Mount. In-Ceiling Mount allows the GV-FE421 to be mounted into the ceiling, revealing a small portion of the camera. Thanks to the scalability of GV-Series, you can easily integrate surveillance system and IP cameras, and load analog and digital video data into the same interface to become a comprehensive hybrid solution.The GV-Series Surveillance System V8.5 is able to process video signals from IP cameras over TCP/IP network. 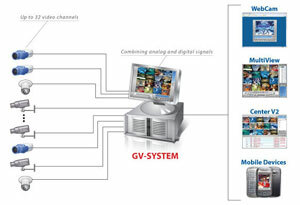 Combining the best of both the analog and digital worlds, the GV-Hybrid DVR is a versatile video management platform. It answers needs for a transition from a legacy analog infrastructure towards a pure IP surveillance environment. In the version 8.5, the GV-Hybrid DVR comes with a rich panel of features to streamline surveillance operations and enhance management capabilities. Remote surveillance is implemented via 3GPP, IE browser and GeoVision GV-MultiView. For the purpose of central monitoring, the GV-Hybrid DVR offers an extensible solution for multi-site surveillance and control to manage numerous cameras from subscribers. The GV-NVR System Lite is a light-weight and an ultraslim GV-NVR System, with which you can record video files directly to the internal hard drive. The GV-NVR System Lite supports up to 8 GV IP cameras and/or third-party IP cameras for networking surveillance, with plug-and-play function for GV IP cameras to connect to the unit automatically. 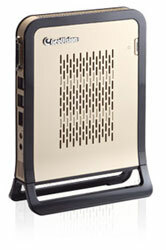 The GV-NVR System Lite is an ideal NVR system for small business or retail stores.